McIntosh announces a new £5.5k headphone amp with DAC | What Hi-Fi? 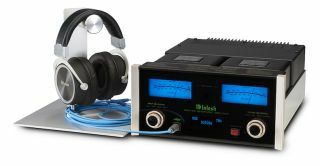 The new MHA150 headphone amplifier is built with the McIntosh’s second-generation digital-to-analogue converter, as well as the company’s ‘Autoformer’ technology. McIntosh has announced that it will be bringing out a new headphone amplifier later next month. The MHA150 is intended to be used mainly with high-quality headphones - but it can also drive "small bookshelf speakers" via its 50 watt stereo speaker outputs. It contains the company's second-generation DAC, so it can be used with smartphones, tablets and computers - and there are connections for two analogue devices. There is also a USB input that’s compatible with PCM signals up to 32-bit/384kHz, as well as DSD and DXD files. The amplifier also uses McIntosh's “Autoformer technology”, usually found in its larger mono and stereo amps. Autoformer is tailored for three headphone impedance ranges, it is claimed, specifically to improve their “sound quality and performance”. Priced from £5500, the MHA150 will be available in October from Jordan Acoustics.